Airports and airlines are a high speed, high reliability operation where even the smallest issue can cause a massive problem. Every piece of equipment in your operation needs to work on time, every time, so you can continue to perform. Our PosiCharge outdoor-rated chargers have the proven reliability to be trusted in some of the world’s most extreme environments, from airports in Alaska to U.S. military bases in Afghanistan, to do just that.  Our easy to use, intelligent and durable chargers can fit any charging need while keeping your employees safe, your equipment optimized and your operation performing smoothly all while reducing operating costs. With advanced battery optimization and safety technology, you can be assured that no matter the type, size, voltage or brand of batteries your equipment uses, they will be given the best charge possible. PosiCharge eGSE fast charging systems power 15 of the world’s largest airports, 11 of the largest airlines, and US Air Force bases around the world. 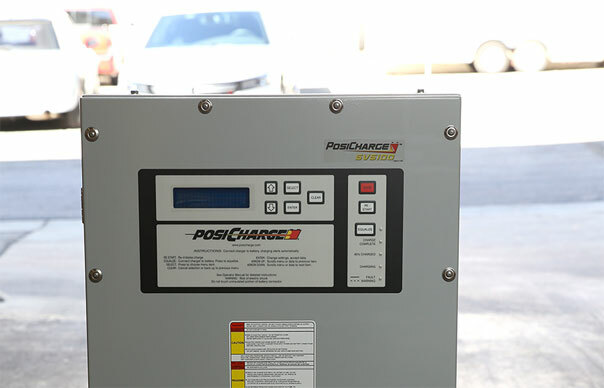 The PosiCharge SVS100 outdoor fast charger is compact and perfect for light duty operations like small cargo warehouses, GA and FBO airport operations, regional jet operations and for charging other large electric equipment in a non-hub environment. Light duty doesn’t mean light on features. The SVS100 comes with PosiCharge’s advance safety, battery management and optimization features that make all of our products top of their class. The PosiCharge DVS line of outdoor fast chargers is a perfect stand-alone solution for small or remote fleets with heavier applications. With the flexibility to charge one or two vehicles, and the ease of the stand-alone design, the DVS line can keep your operations moving in the toughest situations. Like all PosiCharge chargers, the DVS line comes with our intelligent battery management, advanced safety features and rugged design. The PosiCharge MVS line of intelligent, distributed outdoor fast chargers offers the benefits of a large charging system without the added maintenance and infrastructure costs. With our patented ability to charge up to 16 vehicles simultaneously, and to share power with existing infrastructure, like the jet bridge, the MVS800 is unparalleled. Our intelligent battery management technology directs power to the batteries that need it most, while keeping the temperature in an ideal range to extend battery life. Combine that with our advanced safety technology, fleet management and rugged design, and it is easy to see why the MVS800 is the industry leader. Robust & reliable. Outdoor-rated to withstand extreme conditions. Our advanced charging algorithms and exclusive safety features keep your workers safe, as well as protect your equipment from damage. You can rest assured knowing that your most important assets are protected. PosiCharge eGSE chargers are the only fast chargers on the market that have been tested and certified to meet the most demanding requirements and regulations. Our hands-off technology simplifies operations to the point where your drivers hardly have to think about charging. As a technology innovator, PosiCharge’s award-winning team has reinvented the entire paradigm of fast charging, and developed powerful charging systems that made charging faster, simpler, and safer, and saved millions for our clients over the years.